At Doosan Enpure Ltd we are committed to preventing pollution and looking for opportunities to reduce any negative impacts to the environment associated with our operations. We aim to achieve this by working to consistent processes that form our Integrated Management System, and meet all relevant requirements of legislation and industry standards. By establishing and reviewing key measures on our environmental impact we ensure that we ensure that we meet these objectives whilst continually looking for opportunities to improve the management system and so further minimise the potential to impact negatively on the environment. 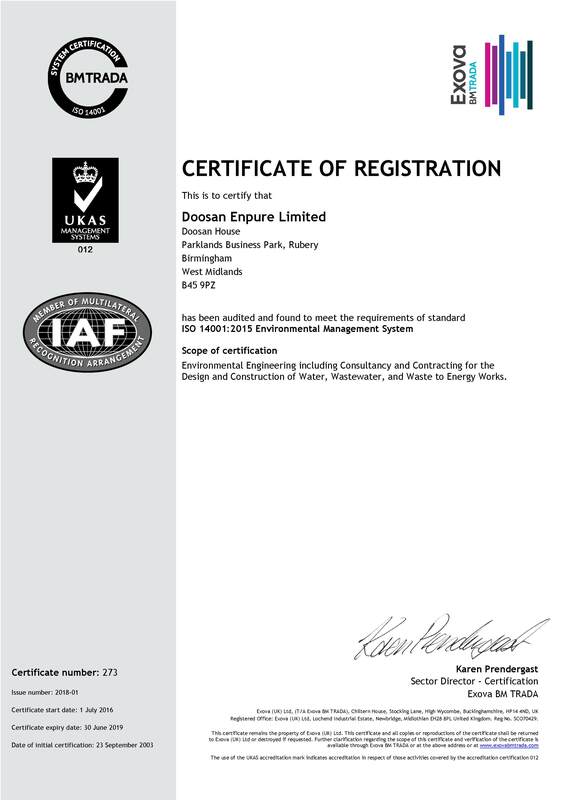 Both engineering solutions offered and sourcing of suppliers takes into account the sustainability of our proposal and the impact on Doosan Enpure’s carbon footprint. A copy of the environmental policy statement is available upon request.